I have created a new blog page entitled "Cooking With Dreena" to post articles that I have written, and other food and cooking tidbits for your use. So, to bring you down from the 'chocolate high' of the last two brownie posts, my first article is about the very healthful whole grains: kamut, quinoa, millet, and spelt. 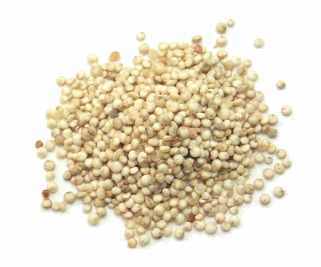 This article contains nutritional specifics for each grain as well as basic cooking information. This article makes for a fairly lengthy post, so you may want to print it off for easy kitchen reference. Hope you enjoy...! I love Quinoa. I usually mix it with some water and veggie broth, and then put it in the microwave (Bad, I know! But it's cheaper than our stove and faster). Hi Mal! Glad to see you posting/commenting again! As for me, I have just been getting into Quinoa. I really must start doing more things with Millet, Spelt, etc. I am just not sure were to start. I buy certain products I find with them but have never tried much at home with them from scratch. 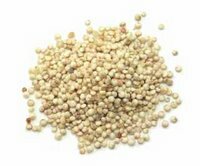 Quinoa and millet are both pretty quick to cook - esp quinoa, as noted in the article. I don't use whole spelt and kamut that much, but they are easiest (and I think best) to put in soups when the soup requires a longer cooking time. They are chewier grains, so I prefer them in a soup rather than on their own. I saw Red Quinoa at the store the other day and got it--made a really nice pilaf with it, but I'm perfecting the recipe. I don't think you need to rinse it before cooking, the way you do regular quinoa. Hi Danielle, I was on your site earlier today and read about the red quinoa. I have heard about it, but have never seen it. Did it taste any different... do you prefer it to regular quinoa? It doesn't seem to taste that much different, but it's been a while since I had regular quinoa on its lonesome. I do like it though, and I think it would be awesome to mix both types of quinoa in a pilaf and absolutely cook in vegetable stock instead of water.